This is the cake that I entered in the ‘decorated sponge cake – max 8″ tin’ category. I am surprised it only came second – perhaps the judge didn’t know the skills that I was using to make this cake. Or perhaps it was too modern! I thought I was onto a sure winner but it shows how wrong you can be! I thought I’d share with you the thought processes that I put into creating something such as this. The first part is ‘the brief” which in this case is also very brief and doesn’t give much away as to what they are looking for so I needed some more information. I bought the ‘WI On With The Show’ book which is their handbook for showing. Now, although this local show is not an official WI show, after last years remarks from other competitors I felt that it would probably be best to stick to WI rules and to stick with traditional things (which I didn’t do in the end which was probably my downfall). 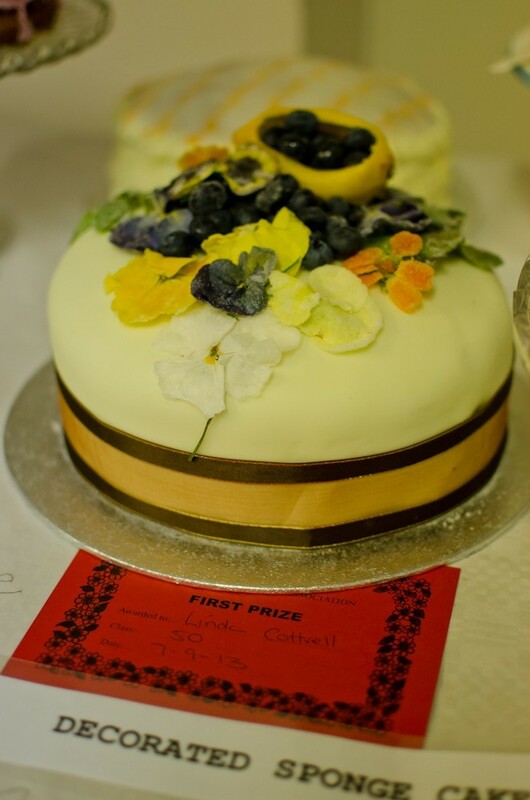 In the book, there wasn’t a section on ‘decorated sponge’ only for ‘decorated sandwich cake’, though this specified only the top of the cake was to be decorated and both the decoration and cake are judged, no covering of sides with nuts, chocolate etc as this is a gateau, colour design and neatness are important and decorations should not be heavy. 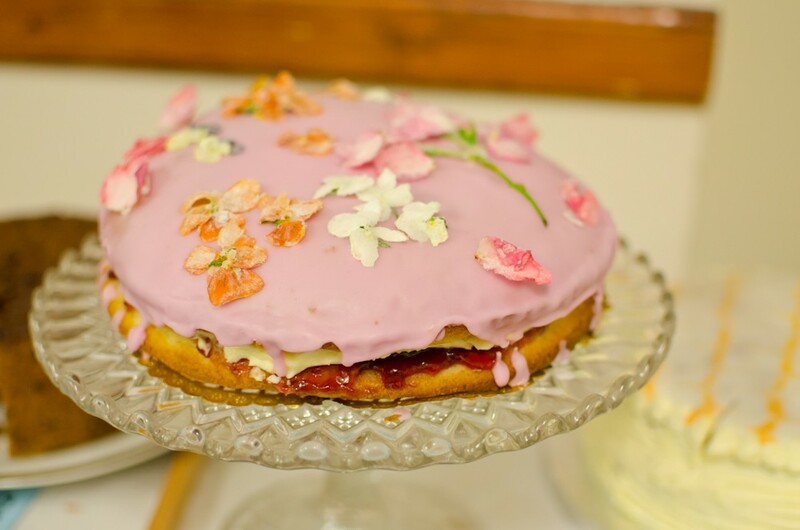 OK, so I now had some idea of what they might be looking for but when decorating I tend to just smear on some frosting or buttercream and dot with fresh fruit or strew with coconut or chocolate which obviously was not going to cut the mustard here. But must not forget flavour. So I looked online and in my cake books so some inspiration and started to sketch a couple of ideas. The first idea was sugar fondant covered cake with either a painted surface (like this http://amelieshouse.blogspot.co.uk/2011/07/painting-on-cake-class.html) or traditional sugar paste flowers. Problem. I HATE sugar paste. So I looked at what other coverings could be used for cake and I found some ideas using buttercream covering. Perfect – I’ve made it made before and it is yummy too. I found in Pinterest some cake ideas (http://www.pinterest.com/kimmclain/cake-decorating-ideas/) and a vision appeared in my head one night when I was lying awake; lavender coloured buttercream covered cake of three tiers to get the right proportions, with a swirl of contrasting flowers and possibly butterflies. So next I was thinking how I could take the buttercream covering to a new level. I read about crumb coating and how to achieve a smooth finish and watched some YouTube videos on how to achieve this. I bought a straight sided scraper but held off buying a rotating cake stand. But I didn’t have time to practice before the day. The American websites were certain that you needed some vegetable shortening in the buttercream to get it firm but my first batch with shortening in was lumpy and tasted yucky! I had planned for the cake to be lemon sponge with a lemon curd filling and lemon essence in the buttercream but I forgot to add the lemon zest to the cakes so had to quickly revise the plan to old fashioned vanilla sponge with raspberry jam and butter cream filling and vanilla flavoured buttercream. Oops! 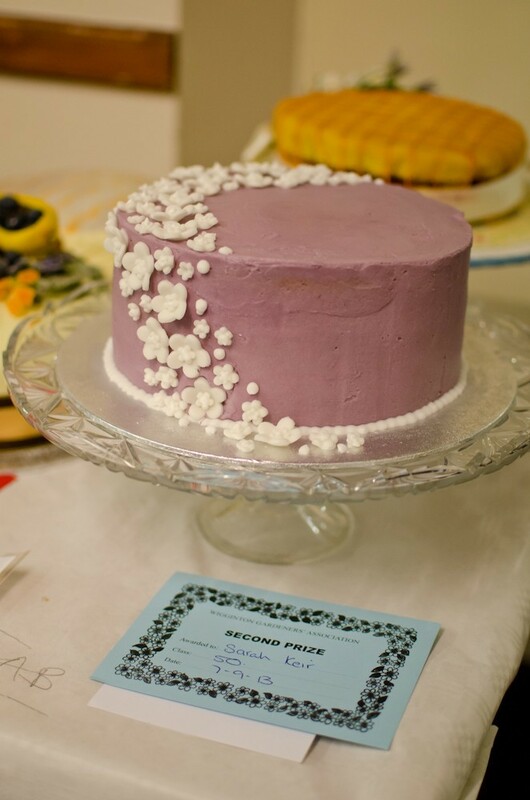 The colour hasn’t come out quite right on the picture – it was a lovely old lady lilac-lavender colour, as I added Sugarflair ‘Grape Violet’ to the buttercream. I decided to go with contrasting plain white sugar paste flowers and a piped white royal icing beading around the base. So this cake showed skills in planning, design and execution of three major cake skills of smooth buttercream icing, sugar paste flowers and royal icing piping. What more did they want? Sadly they didn’t even cut into it to see the three layers.